In this increasingly crowded world, small is the new big. And there’s no hotter segment right now than the small crossover and the luxury brands have taken note, which is why Audi has decided to bring the Q3 to America; slotted below the popular Q5 and prepped to go head-to-head with a crop of new arrivals. There are some clear-cut trends in the auto biz right now: 1) product lineups with downsized, city-friendly offerings and 2) bestowing a coupe-like design to vehicles with 4 doors. 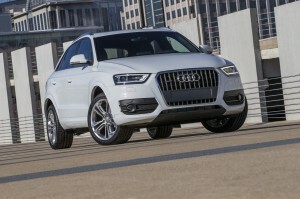 Both are exemplified in this 2015 Q3, the new gateway to the Audi SUV lineup. So how small is it? The Q3 is 8.0” shorter between the front and rear wheels than a Q5 with a roof that’s about 3.0” closer to the ground. It plays in the burgeoning small premium segment alongside vehicles like the BMW X1, Mercedes-Benz GLA and the Lexus NX. A base front-drive Q3 starts at $33,425 while this Premium Plus quattro model begins at about $2,000 more. A more luxurious Prestige model is also offered. All Q3s come standard with a 200 horsepower 2.0-liter turbo-4 and a 6-speed automatic transmission, producing a 0-to-60mph time of 8.2-seconds with all-wheel drive. An aggressively geared transmission with sport mode keeps the Q3 feeling decidedly quicker than the numbers show. At 207 pound-feet of torque, the Q3 packs far less rotational motion than its competitors, though at 3,682 pounds it’s also one of the lightest. Unfortunately its EPA estimates can’t keep up with Joneses, rated at 20mpg city/28mpg highway on premium. Having been running around Europe for the past 4 years, the Q3 is new to us but it isn’t new. And that fact is evident in just about every aspect of this vehicle. Now, it does deliver on the goodness of a German-engineered, premium drive. And other than occasionally wishing for it to be a little quicker, it has a compliant ride, connected steering and Audi-level agility. But driving traits alone aren’t good enough these days. And the rest of the vehicle looks and feels like it’s been on the shelf for a little while. It’s a decent little all-wheel drive runabout but it simply doesn’t distinguish itself enough to make a gotta’ have it impression. I have to admit, the Q3’s stubby body design made me a believer as the week evolved, no doubt aided by the richness of the Brilliant Black paint, killer 19” Offroad design wheels wrapped in very expensive ContiProContact all-season tires, and awesome looking LED light treatments front and rear. But it’s really the drab cabin where the Q3 loses Brownie points. The standard panoramic sunroof and aluminum inlays are modern touches, but other visuals like the pleather seats, switchgear for the climate controls, and this basic version of the MMI system create a sense of yesteryear. For example, I’d happily trade these 2 SD card slots for even 1 USB port and there are no advanced safety electronics to speak of; not even a back-up cam. Because the Q3 is on the small side even within the segment, getting things to fit is a bit more challenging than say in the BMW or Lexus. The seats drop only from the seat handles but the cargo area provides a wide, mostly flat useful cut and can be had with an optional power tailgate. Two more can fit comfortably in the back with just enough leg and headroom for most adults. As seen here, the MSRP for this optioned Q3 Premium Plus 2.0T quattro is $38,625. A full redesign is reportedly slated for 2017 when the Q3 will move over to VW’s ubiquitous MQB platform, a one stop shop for the group’s automobiles with transverse-mounted engines. CLICK HERE to get a FREE ONLINE PRICE QUOTE for your NEW AUDI from a dealer near you. Absolutely NO OBLIGATION. CLICK HERE TO FIND TODAY’S HOTTEST DEALS! TURN HERE FOR ALL YOUR AUTOMOTIVE NEEDS AND MORE. 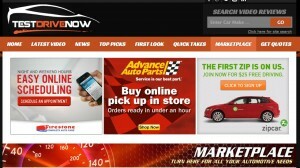 CLICK HERE to LIKE TestDriveNow.com on FaceBook! FOLLOW Steve Hammes on Twitter @DriveTimeVideos!